With one more episode left until the season finale of Telltales’ Walking Dead game, Episode 4 was tasked with building up tension that would have to be resolved going into the last episode. I’m happy to say that the episode does just that, and still finds a way to keep players guessing about what will happen next even after experiencing the previous three episode that brought up some pretty crazy events. 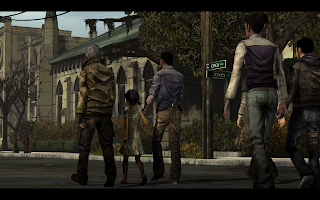 In the beginning of the episode, the gang finds their way into a new town as they hope to find a place to relax and care for Omid who is still hurting from the train jump. Kenny disagrees with this plan, and is focused on finding a boat and sailing away from Walkers and his troubles, and Lee attempts to figure out who have been speaking with Clementine from her walkie talkie. Tense moments from the characters pop up frequently in this episode, and the stress piles on a bit more when you encounter some of the new characters. Gameplay wise things are about the same, but there are more action-y sections that give you direct control in shooting walkers from a semi first person perspective. This episode seemed a bit shorter in comparison to the previous three, but it still manages to keep up the suspense factor while creating anticipation for episode three. There are some really drastic moments in this episode, and most do a good job of letting you add input based on prompts you choose for Lee to use. The locations in episode four are all pretty well done and are nicely varied. While this episode is shorter, there are some more interactive elements to find than past episodes, with most being used to solve specific puzzles that you’ll encounter. Sound is top notch as always, with effects and music pieces coming in that help bring together the emotional impact of the episode. These games have been just as intense as the TV show and comic of the Walking Dead, and provide great chunks of gameplay and story at only $5 each. This another solid episode that you have to check out! 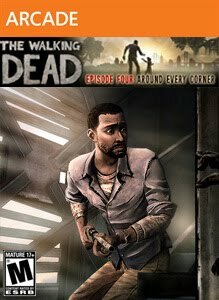 "Episode four of a five-part game series set in Robert Kirkman’s award-winning universe. In the wake of terrible loss, the group arrives in Savannah in search of salvation from the horrors around them. Stalked by an unseen human threat and the constant menace of the undead, learn to deal with an increasingly paranoid group and how to protect Clementine."